Innovation is an important, long-term sustainable source of economic prosperity. 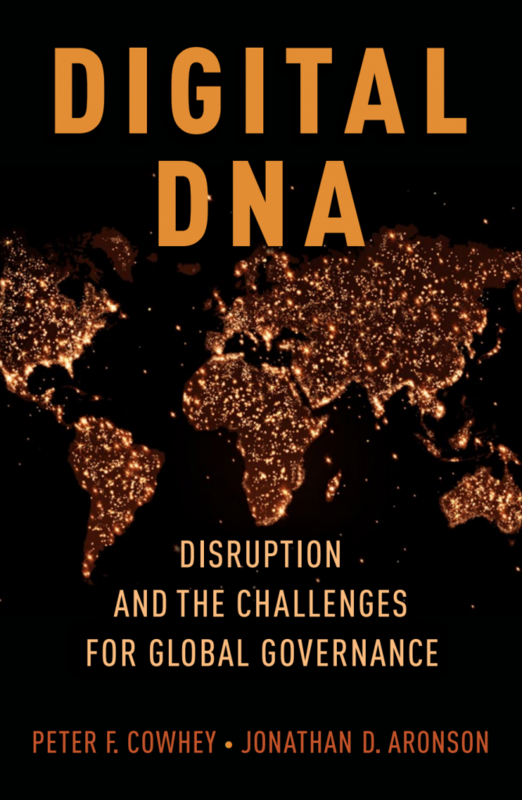 Digital DNA identifies how digital information and production technologies, the Information and Production Disruptions, are transforming how companies and national economies are innovating. Wisely guiding this transformation in innovation is a huge challenge for global prosperity. Even traditional industries, like farming, are changing rapidly as new paths to improved productivity and new business models challenge incumbent market leaders. This produces political economic tensions over how to adapt public policies to new technological and market surprises. Part One draws conclusions about the future vector of the tensions and policy challenges that must be managed and argues that national and international policies require experimentation and flexibility to address this fluid situation. Part Three illustrates three case studies to illustrate the changing market dynamics, the logic of the policy trade-offs confronting society, and the political economy of practical decision-making. These cases probe issues tied to the rise of Cloud Computing and trans-border data flows, international collaboration to reduce cybersecurity risks, and the consequences of different national standards of digital privacy protection. The case studies show that significant diversity in individual national policies is inevitable, but a common international baseline of policy fundamentals that facilitate “quasi-convergence” of national policies is needed. Moreover, expert Multi-stakeholder organizations that facilitate the implementation of formal government policies are part of the most promising approaches to governance. MSOs should operate across national boundaries because the implications of digital technologies are global. Parts Two and Four of Digital DNA propose a strategy to revamp the international governance regime for digital technologies. A series of international trade agreements can help markets respond more smoothly to the emerging consequences of digital disruptions. The policy objectives of the trade agreements are, however, unattainable without better measures to safeguard digital privacy and cyber-security. Formally linking such safeguards to trade agreements can help achieve stronger enforceable safeguards. A “Digital Economy Agreement” that embraces “soft rules” that require governments to create policies that achieve certain objectives, but leave the specific design to national discretion, can achieve the degree of quasi-convergence of national policies necessary for a new innovation system to flourish. Incorporating MSOs into implementation schemes of these international agreements will improve their political legitimacy and their technical expertise to incorporate flexible learning into the governance regime.